Just wanted to wish everyone happy, healthy and prosperous new year. 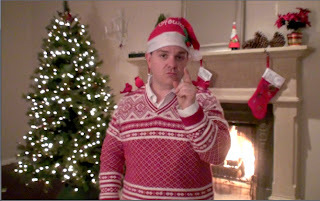 Ugly Christmas Sweater Segment on The View from Jody Mulkey on Vimeo. Here is the segment that we were in. While it might be logical to think that I am sad that Christmas is over, the statement couldn't be further from the truth. I also wouldn't say that I am stoked the season is over. 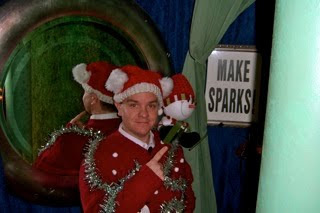 What I would say is that all of the excitement arround Ugly Christmas Sweaters has me energized to say the least. Why else would I be so giddy to doorbust Michael's ;) I am not sure how far the Ugly Christmas Sweater train will take me, but I am looking forward to finding out. 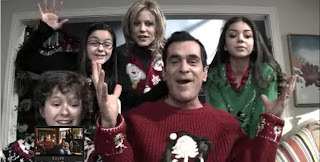 As I sat down to write this post my wife put on an episode of Modern Family, and as fate would have it... the episode starts out with the Dunphy Family wearing their Ugly Christmas Sweaters video chatting with the grandparents. Talk about a small world. So after my experience yesterday on The View, I am well...let's just say invigorated. I had to go to San Francisco for work for the day and I made lots of friends on the plane. One special lady was Michelle our flight attendant on Southwest. I thought her flare was impeccable, but I will let you decide for yourself. I mean check out her light up necklace and that fantastic santa apron. Turns out that another flight attendant makes them and gives them to her flight attendant friends. Hmm. Maybe we need to expand into aprons. Another fine sweater afficionado happened to be sitting behind us. 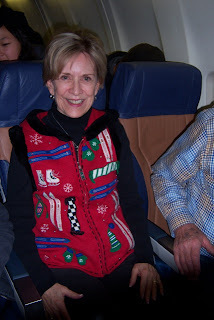 Although as I told her, I think her sweater is way too classy to be considered an "Ugly Christmas Sweater". The fantastic faux fur collar really just sets this sweater apart. 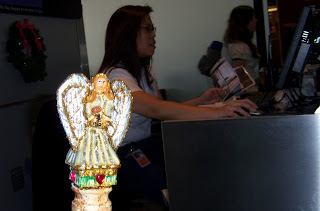 Then the piece de resistance was my friend Charlie that I met at the SFO airport. His sweater may have been subdued, but he did rock a cane that has to be seen to be believed. It is more of a staff (think Raiders of The Lost Ark). 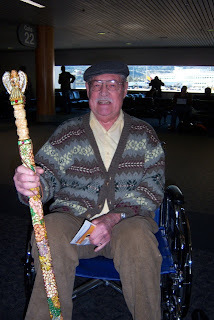 Charlie is 81 years old and is very proud of his cane. Obviously he has done some modeling in the past as he was a natural in front of the camera. Just a closeup of his holiday themed cane. You go Charlie!!! Behind the scenes video from my experience on "The View"
The episode of The View with the segment on Ugly Christmas Sweaters show will air tomorrow Christmas Eve 12/24 at 10 am Eastern/Pacific and 11AM Central on ABC. Below is a behind the scenes look that we put together in the green room between rehearsal and the actual show yesterday morning. Behind the scenes at "The View" from Jody Mulkey. Looks like Ugly Christmas Sweaters have hit the bigtime. Last week a researcher from the tv show "The View" contacted me via Facebook, they were doing a segment on Ugly Christmas Sweaters and found this site. At first I thought it might be some kind of scam but after talking with the producer it sounded promising. I still didn't believe it was real until I got a confirmation for the hotel. Next thing I know I am beefing up my collection of sweaters and on a plane to NYC. I am blogging from the green room and we are going to do our segment in about an hour. I will publish pics and more details afterwards. Well after much ado, we are proud to announce that we are ready to launch our new video coverage. Enjoy! Ugly Christmas Sweater Shop Premier from Jody Mulkey. Well today is the day. At the office we are having our annual GiftZilla (think white elephant gift exchange) and BakeZilla events. Don't let the names put you off. I work at an awesome internet shoppping company called Shopzilla (we run bizrate.com, beso.com, shopzilla.com and a host of other shopping sites in the US, UK, France and Germany), so long story short everything we do has something "Zilla" in the title. 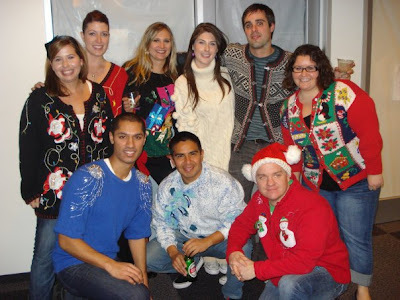 Enough rambling, part of the tradition is to encourage folks to wear their ugliest christmas sweater to work on this day of holiday cheer. I will be sure to post some of the best pics after the celebration. 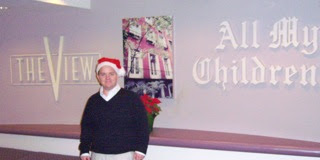 Who hasn’t pondered this seasonal conundrum: How can I salute the holiday season in style AND comfort? “Colonel Cardinal” is here to lead the way! A vision in crimson and white, the “Colonel” arrives complete with epaulets of majestic cardinals perched upon your shoulders calling out your individuality and flare for all things holiday. Rendered in a snugly mohair knit, this V-Neck Ugly Christmas Sweater is as soft as fresh fallen snow. But a heck of a lot warmer! Iridescent beading and sequins mean the “Colonel” is always party-ready! Just add eggnog and let the good times roll! Colonel Cardinal from Jody Mulkey on Vimeo.